The doors sense your presence as you approach, and like a bride, the moment you step over that threshold, life becomes something different. The air is cooler than it needs to be, so despite the sticky, liquid heat of the Queensland Summer, you have to remember to wear long pants and covered shoes, or you will be shivering by the end of the long, long day. The lighting is vivid, casting shadows on your face, highlighting the bags of concern that have grown, dark and haggard, under your eyes these last few days as you waited for this moment with fearful anticipation. Equal parts relief and dread. At the check in they call your kid by name, but they place a band around her foot, tagging her for the duration, and although they still refer to her by the name you chose for her, they really know her as UR 54021. Those five digits storing all that they need to know. Her name is just a concession to convention. As you walk the long corridor to your glaring, sterile habitation for the day, all sense of who you were out in that other world sloughs off you, and you become part of the machinery of intervention. The more completely you can exfoliate the remnants of your concerns and your individuality, the better you will fare on this day of immersion. Cleansing yourself of your self makes for a smooth transition into a day where all decisions will be made for you. The people in white are also tagged and numbered, and they will direct your progression. Come here, move there, put your arm here, wait there, eat this, hold still, hold still hold still HOLD HER STILL, whilst they prick and insert this steel along the lines of her veins, filling her up with the liquid of life that you know she needs, and yet the last remnant of you that still recalls the outside you, resists and recoils from. The day is long and long, and long after you have forgotten your own name, or the feel of the fresh brush of sunlight on your skin, you are released out into the bigness of the twilight sky and you can fill your alveoli with air that is moistened from sugarcane and life. You breathe that warmed air in gulping mouthfuls, filling your cheeks like the guppy at the bottom of the fluorescent fish tank you have left behind. Fare you well little fish, and all of you big fish, stuck in your tank of surreal activity. And you silently cross your fingers, hoping with futile desire that there won’t be a next time. By the time you read this it will all be over, and my girl, will be tucked up tight in bed, dreaming of who knows what. She usually stirs quite a bit, this night. If sleep is the subconscious downloading, then I guess she has loads to down. When she was a bub, we would have fractious nights in the lead up to a transfusion, but the night after was always the worst for me. Leaving the hospital that night was always wonderful. I’d sink into the seat of the car, Coco all bundled into her capsule, and I’d just sit. I would bask. In the relief and the relief and the relief. There was no other time in my month-or-so quite like it. In that car, at that moment, we were as far away from the next transfusion as we could possibly be. Every second from then on moved us closer to the next one. So I would bask. I would waste some of those precious moments, allowing the soothing to trickle over me, knowing that the night ahead would be long and strange. That she would wake and cry and stir and wake. She would need feed on top of feed to try and rehydrate after the mid-transfusion diuretic. Nappies soaking. Mind churning. Things are easier now of course. We have grown used to the process, and the procedures. She told me today that if she looks at the cannula before it goes in she feels “all funny in her tummy” and that even though she can’t feel the blood actually going in, it hurts if we move the tubing too much. These are things I haven’t known before. So perhaps it will get easier still. She has a good memory, my girl. She recalls all the parts of these two days. On the first day we get the blood taken for cross-matching, and she remembers the time her skin got pinched and drawn into the tourniquet and had to be pulled out. She remembers the time blood went spurting everywhere. And she remembers all the times, like yesterday, when it takes one or two or three attempts to get that sample out. So sometimes she might cry when it doesn’t seem necessary. Because she remembers well. On the second day we receive the blood. We present to the hospital and we wait until hand-over is done and rounds are completed and then, at last, it is our turn. She is on edge until then, my girl. She knows what is coming, and that no amount of playing in the little park, or watching the fish in their tank will blunt that feeling of foreboding, or the feeling of that needle piecing the plump baby flesh, just near her dimpled knuckles. 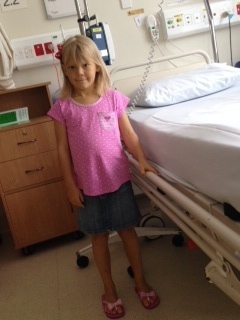 She remembers well, my girl, so she tells the doctor that her right hand is the best one for puncture. “This vein, right here”, she says, tracing the blue feint on the dorsum of her hand. They hear but don’t listen, so the left hand is tried first. Then back to the right. Usually she starts crying at a reasonable volume, well before they take the first stab. I lie on top of her, and hold her arm firm at the shoulder, to make sure she doesn’t move, but she never does. Even as an infant, when they wanted to wrap her up like a cat in case of writhing, she never did. I know without looking when the needle goes in, and then, when they blow that first vein, as her screams spike and spike. He eyes widen, as big as the moon, as if she is surprised, still, at how it feels. This day, it was different. Earlier on, the music therapist had spent some time with us, singing to Coco, playing and showing her instruments. Calming her. She asked Coco’s favourite song, and I said: The Lion Sleeps Tonight, regretting it instantly, as the therapist played that stupid song over and over, those wimmewehs scratching on the blackboard of my jangled nerves. But it soothed my girl. She snuggled into my arms, and as that beautiful hippy played and played, and it was true that music is a salve for the soul. When we went into the treatment room we played the wimmewehs on the iPod, and as that first vein was blown, she cried, but perhaps not as much as she used to. Calmer or not, there’s only so much sleeping one lion can do, so we changed to Green Spandex. The funeral song, from the when that feels like yesterday. We stared into each other’s eyes, my girl and I. I think she was expecting me to cry, and I know I was expecting her to, both for different reasons. Blue eyes locking onto brown. We couldn’t be more different sometimes, my girl and I, but we held our eyes, and we held our strength. I’m sure we both felt like weeping, for some reasons different, and some the same, but we didn’t. We breathed deeply and we held each other and we waited for the pain to pass. It hurt. But we got through another little bit. Sometimes we couldn’t be more alike, my girl and I. If you have already donated blood in the last 3 months, Thank you, From The Ashers. If you haven’t, you could call 13 95 96 to find out how.